Threading pasta or wooden beads are standard preschooler activities. But what other threading activities are there? Here are a few we've used over the years, from twelve months to four years. We know that threading is good for concentration, coordination and developing fine motor skills. Activities that strengthen the muscles in the fingers and the hand and have the child use the little pincer grip (when the child uses the index finger and the thumb to pick up and manipulate small objects), help to prepare the hand for writing. All of the ages listed are very general and are to be used as a guide only. These are the approximate ages my children have attempted the activity but could easily be different for your child. For most of the sewing type activities, Otis is using a large embroidery needle. These are so worth getting for threading and stitching work, they are easy to use with fabrics like burlap but are not sharp enough to prick or hurt the child (if you are sewing buttons make sure the whole needle will fit through the button holes). 1. Threading Sticks into Metal Shaker - 12 months. 2. Threading Sticks into Containers - 12 months. 3. Threading Cotton Reels - 18 months. 4. Threading Pipe Cleaners into Colander - 18 months. 5. Threading Pasta - 2 years. 6. 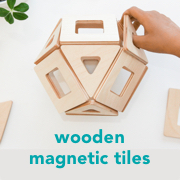 Threading Wooden Shapes (similar shapes here) - 2 years. 7. Threading Wooden Beads on Leather - 2 years. 8. Sewing Card - 2 years. 9. Hand Sewing Rainbow Wool in Burlap - 3 years. 10. Sewing Buttons - 3 years. 11. Hand Stitching - 4 years. 12. Sewing Felt Hearts - 4 years. 13. Threading Natural Materials - 4 years (but suitable for a much younger child). 14. Threading Beads onto Wire (to make suncatcher or wind chime, ours have bells on the ends) - 4 years. 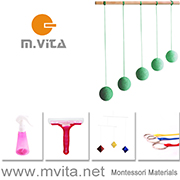 Are you looking for threading toys? All of these are really cute! Traditional: Wooden Beads and Laces / Threading Wooden Buttons and Spools / Wooden Beads. Modern: Threading Board / Threading Ring / Vetrovorm - Threading Laces and Cards. Natural: Threading Tree Board / Threading Branch Cookies / Threading Blocks.